Visual communication fosters a strong safety culture in the workplace. Visual communication reinforces training, displays best practices, suggests safe operating guidelines, and keeps workers aware of hazards. Visual cues like signs and floor tape help to quickly communicate important information in a matter of seconds. Implementing a visual communication strategy is relatively inexpensive, but the results can be significant. The following are a few key applications for safety visuals that could make a world of difference. Hazardous Equipment: By applying hazard-striped floor marking tape around a dangerous machine, workers will immediately recognize and identify the risk before they approach. If certain components on a piece of equipment pose a hazard, use smaller labels to alert operators. 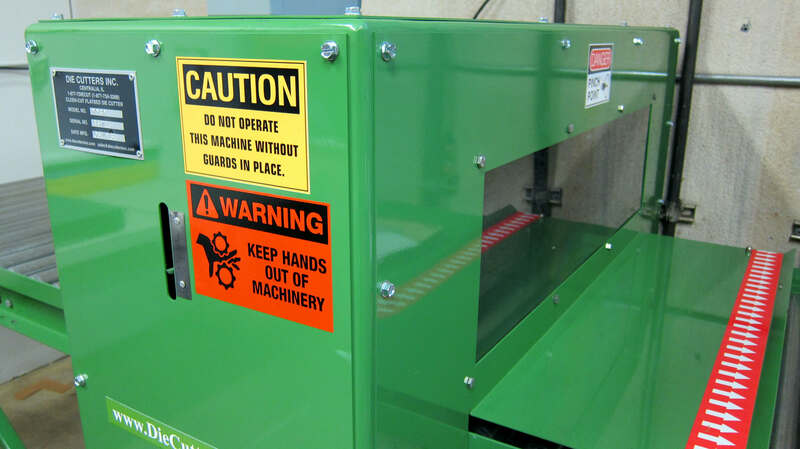 For example, having a label that reads “CAUTION: Hand Protection Required” or “WARNING: Keep Hands Clear” are both effective messages for a machine with a pinch point. First Aid Stations: In emergency situations, every second counts. You can ensure first aid stations like eye washes or emergency showers can be quickly found with visual cues. One way you can do this is by marking offthe area with floor tape and install a large, easy-to-see floor sign right in front of the station. Not only will this make these stations easy to find, workers are reminded to keep that area clear. You could also post safety wall signs with arrows around the facility for easier navigation. Traffic Control: It can be dangerous when powered industrial vehicles, workers, and facility visitors are all moving around in the same space. Visual communication helps people make better sense of the flow of traffic and everyone can feel more confident as they travel around the workplace. Use yellow floor marking tape to create separate traffic lanes, one for vehicles and one for pedestrians, while adding crosswalks to where the two intersect. Additionally, you can post traffic safety signs like speed limit signs or stop signs to enforce safe driving. Emergency Exits: A facility’s emergency exits must be kept clear and accessible at all times. Floor signs should be placed directly in front of the door and signs posted in the area to remind workers not to block the door. Routes to the emergency exits can be improved by using glow-in-the-dark floor tape or photoluminescent arrows to delineate paths that people can clearly see and follow to safety. Pipe marking: Labeling pipes can be overlooked in a visual communication strategy, but they are essential to safety. Workers, maintenance personnel, and emergency responders all benefit when the pipes contents and direction of flow is clearly identified. Pipe markers use a primary identification, the name of the chemical, as well as a second means of identification, a color combination, so contents can be known with just a glance. Electrical Panels: In order to keep workers safe from electrical hazards, OSHA requires the space in front of and around an electrical panel to be kept clear. Their requirement states that sufficient access and working space must be provided and maintained. Using a combination of floor signs and industrial floor tape is an effective method for staying compliant and communicating standards with employees. Organization: Clutter is a potential hazard and organization makes for a safer workplace. You can even use a visual system, like a posted schedule, to track and monitor housekeeping in the facility. Not only will a better organization system make improve safety, you will find likely find a boost productivity and efficiency as well. Visual communication transforms workplaces from confusing, hazardous places into easy-to-navigate, safe facilities. Since safety is a foundational principle of Lean manufacturing, it’s important to take the necessary steps to make work stations as safe as possible. Visual communication is a little step that yields big rewards. 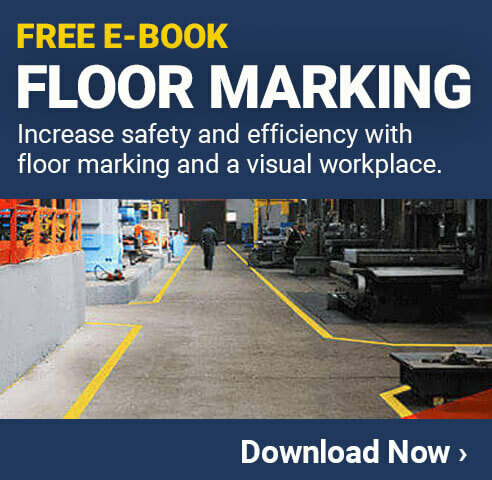 Implement signs, labels, and floor marking into your business today.